Alexandra Stewart pictured bottom right. TUSCALOOSA, Ala.—Recent Northridge High School graduate and PRIDE team member, Alexandra Stewart, has received the honor of becoming the first student from Tuscaloosa to be chosen as a PRIDE International Trainer. As an International Trainer, Stewart will travel across the country leading and developing PRIDE teams in teambuilding activities, leadership, performance, peer-mentoring and drug education. Stewart has been involved with PRIDE for four years, and was a member of the Community Performing Team during the 2011-2012 school year. 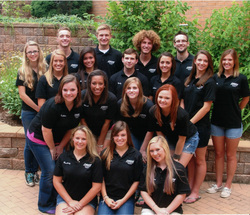 The Community Performing Team is composed of the best students from each high school PRIDE team. It performs at different functions throughout the community promoting drug-free lifestyles through dance and drama. This team was the first ever from Tuscaloosa to perform at national conference where it placed third in the dance competition. “Alexandra has been a true asset to Tuscaloosa’s PRIDE team and the Community Performing Team, utilizing her leadership skills as well as her talent. She will serve well as an International PRIDE Trainer and continue to be an exemplary, positive role model for youth,” Prevention Specialist Penny Deavers said. Stewart will begin her service on the International Training Team in July after a week-long training session in Michigan, and will continue as part of the team throughout her college career. She begins college this fall, and will be attending Maryville College in Maryville Tenn. PRIDE of Tuscaloosa is a 501 (c)(3) nonprofit located in Tuscaloosa. It is an affiliate of PRIDE National Youth Programs, the nation’s oldest and largest peer-to-peer organization devoted to substance abuse prevention and safe and healthy choices through education. PRIDE has served the Tuscaloosa community for over 30 years and currently has PRIDE teams in eight local high schools and one middle school.